I have been trying to program cheap Chinese DDS modules recently. I wanted to add a DDS VFO to one of my bitx rigs. These modules are available at $4.5 from aliexpress. They claim that it can work up to 40Mhz. I used an arduino Uno along with a rotary encoder for controlling the module. 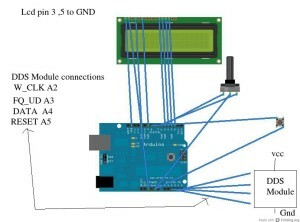 The DDS module pin out is shown below. 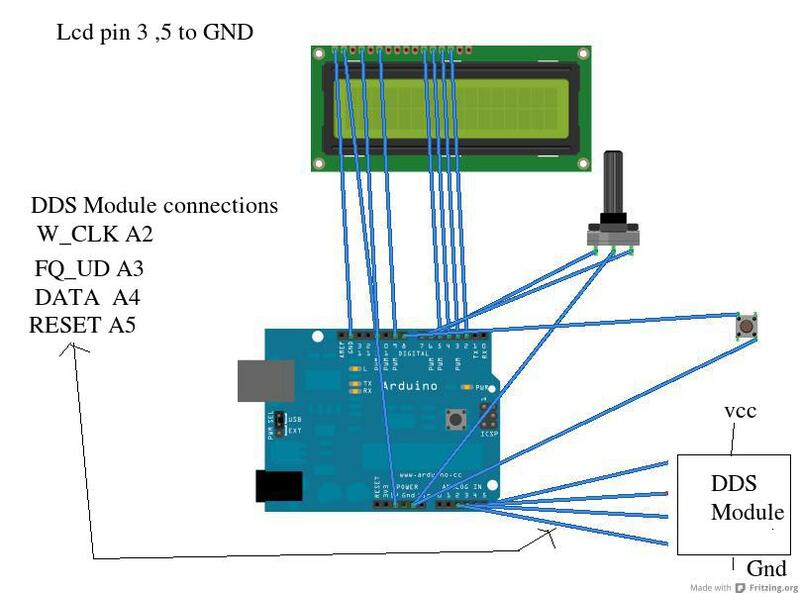 The connections to arduino and rotary encoder is shown below. You can download the code hosted on github from here. 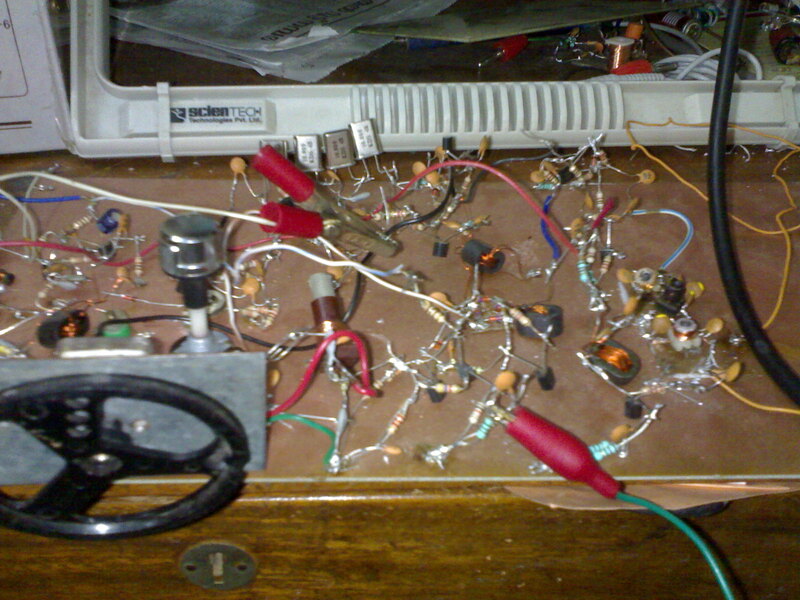 The code is for 40m VFO with IF of 9Mhz. You can easily modify it for other bands and IFs. Additional functions can be programmed easily. The DDS modules are available on line form from many sources. 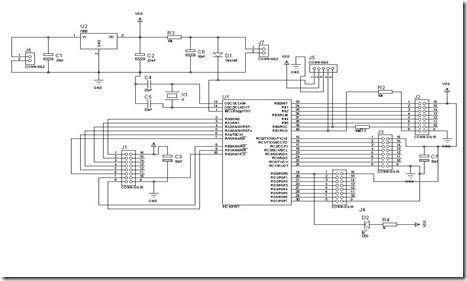 The rotary encoder can be obtained from element14. I was away from home for a week and returned back yesterday evening. As I had a weeks emails pending, the first thing I did after reaching home was to access gmail. 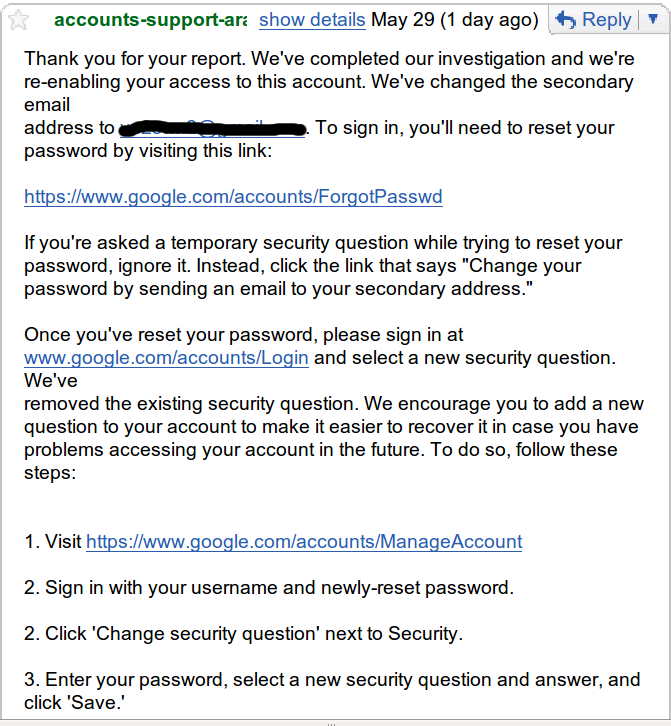 To my horror, google was telling me that I am providing a wrong password. Then, I tried to log in to my blog. I found out that my blog has been defaced. I was getting the following screens, Some Arabic bymn was played in the background. This page will give you some more information on how a hacked page look like. I contacted my web hosting provider and got the password for the site reset and the site was back with in my control. However gmail id was my lifeline and I had to recover it at any cost. 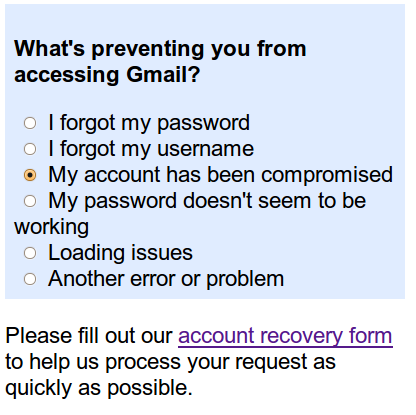 I tried to recover my password from the gmail login page as below. The next page had these options. I selected my account has been compromised which gave me the following link. The account recovery page is here. Have a look at it. Your scucess in retrieving the account lies in accurate answers in this page. I filled out the following sections. Fortunately, I remembered who invited me to gmail. ( I had a gmail account at a time when gmail invites were sold on ebay). Also, I use filters and labels heavily for handling mail. There was some fuzziness with dates , still I could approximate it. I have a couple of blogs linked to the account and an orkut profile. I knew only the url of my blog on blogspot. I was very skeptical whether I will get it back. I submitted and waited any response form google. About an hour later I recievd the following mail from google. I reset the password and retrived my account. The attaker had tried to capture some of my other on line assets from the gmail id. Some of the automated responses had his IP address logged( or it might be a proxy). I traced the attacking IP to Saudi Arabia. Why I lost my account ? There may be several reasons. Here are some of my assumptions . 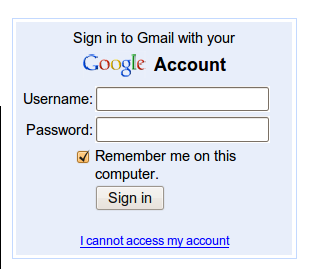 b) I had enabled POP3 access for my gmail account, even though I was not using it. There are plenty of scripts like this available on the Internet for brute force attack on gmail accounts via POP3. 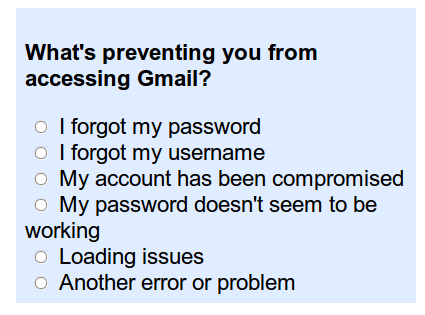 c) I had used my account from a friends place last week on a windows XP machine. May be that machine has a key logger installed and the attacker might have obtained the password via IRC from there. I cheeked my home machines for any possible root kits, but I could not find any. My windows machines do not have internet access. 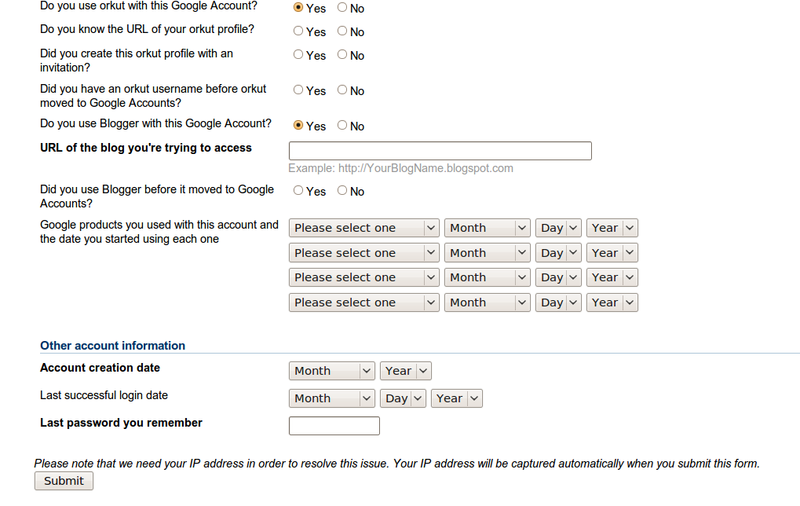 What information one must keep about google accounts. 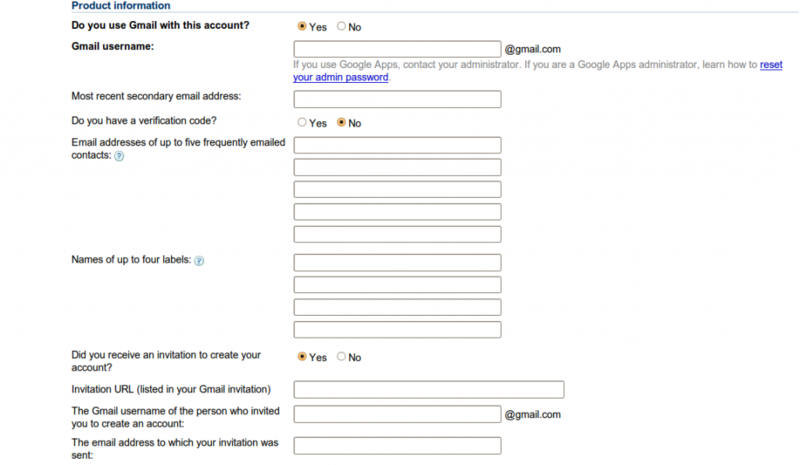 1) If some one invited to a gmail account , keep the email. It can save you a lot of trouble. It will give you some idea about the date of creation of your account. 2) If you use labeling and filters , remember the labels. You can give easy to remember names and context relevant labels to your mail. 3) Even if you are not blogging , create a blog on blogspot . The URL of the blog can be an important information. 6) Set up a security question. It can save you a lot of trouble. 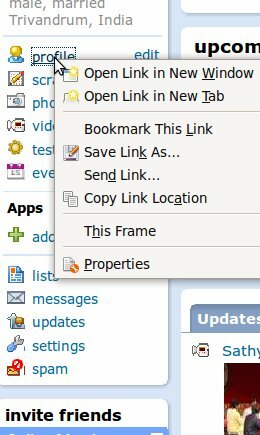 7) If you use orkut, keep the URL of your orkut profile. You can obtain it from your orkut home page as shown in the figure below. 9) Disable POP3 and IMAP if you are not using them. 10 Use a Strong password. This is the most important step. In the change password page, make sure that your password is strong as shown in the picture below. My bitx project has been lying dormant for a couple of months now. I completed wiring about 2 months back. The transmitter was working properly. But the receiver was not receiving anything . When I tried to increase volume, it started howling. After initial testing, I became QRL with lot of other activities. 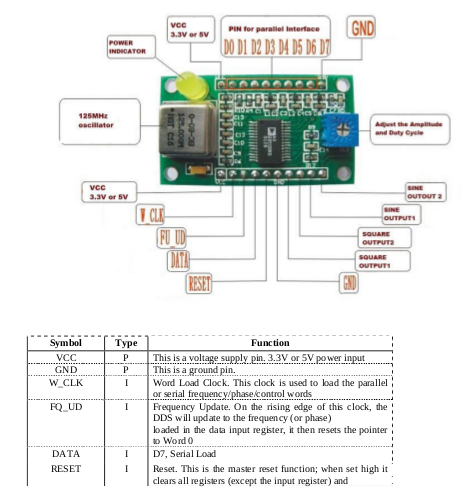 This weekend I decided to look at bitx board again. I carefully rechecked all stages and found out that I had made 2 mistakes in wiring components , a 22 ohms resistor was in the place of 220 ohm and at another place I put a 1k instead of 100 ohm. After correcting the mistakes I fired up the receiver , I could hear some CW transmission around 14.01Mhz. When I increased the volume, the audio stage was howling. I decided to discard the audio stage and build a new one. I bought a small audio module form local market for Rs 25 and fixed it to the board. Now the audio is clean even when the volume is maximum. I am still not satisfied with the sensitivity of the receiver. 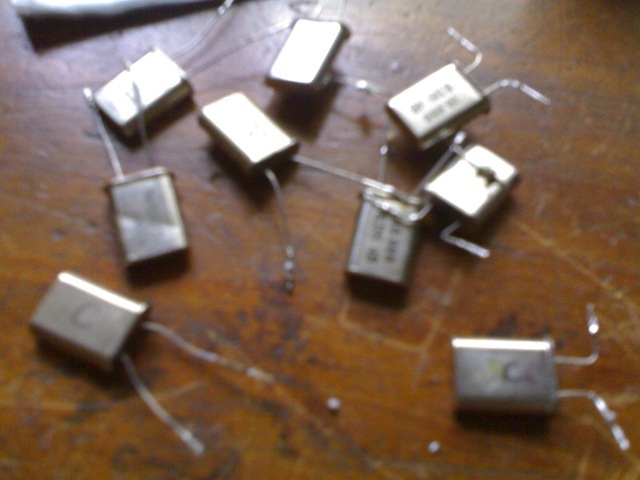 I made the following measurements on various transistors today. 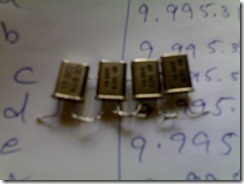 The table of the voltages on transistors are given below. 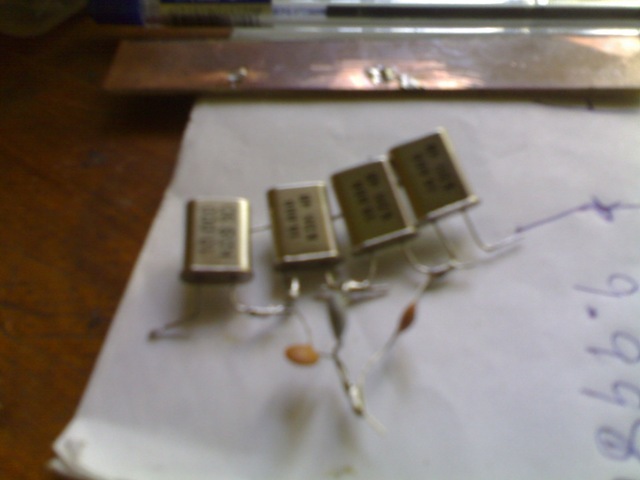 The transistors numbers are based on Bitx V3 diagram by OM vu2wmj Rahul. I think I need to verify the voltages with some other builder. 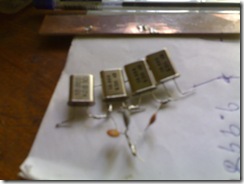 Building Bitx part 2- The crystal filter. 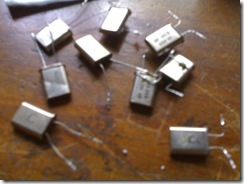 The 10 MHz crystal filter is one of the most important modules of bitx transceiver. Bitx uses an IF of 10 MHz. 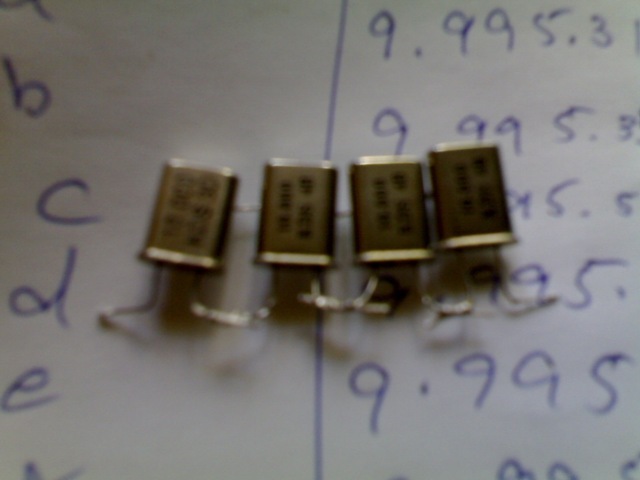 10 MHz crystal filters are available at approximately Rs10 ( 1 US$ = Rs40 approximately) in the Indian market. I bought 10 crystals from a local electronics shop. The first thing I did was to number the crystals with a marker pen. 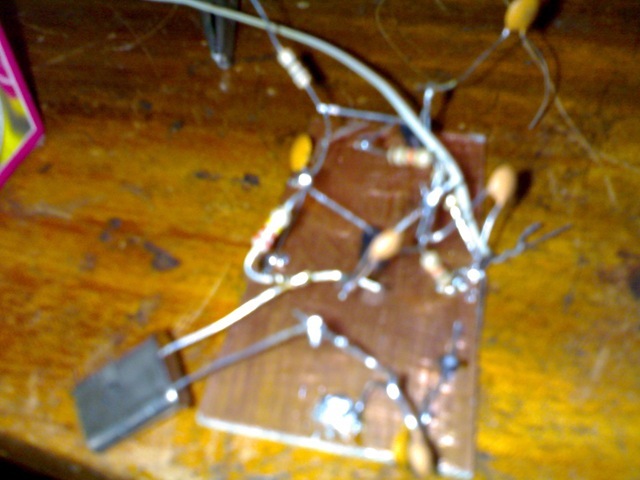 I wired up the following circuit (as described in Farhan’s website. I didn’t have 680pf in my junk box I used 560pf capacitor. 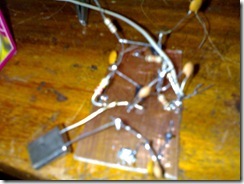 The circuit was built on a small PCB as shown below. Then I measured the frequency of the oscillator. My readings are tabulated below. As per Farhans advice I choose 4 crystals that are matched. 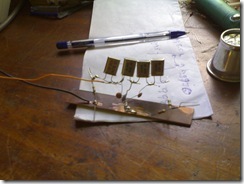 Then I built the filter as shown below. 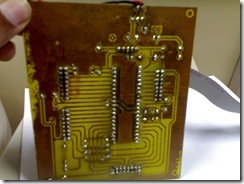 10 MHz filter fixed to a small PCB for testing. 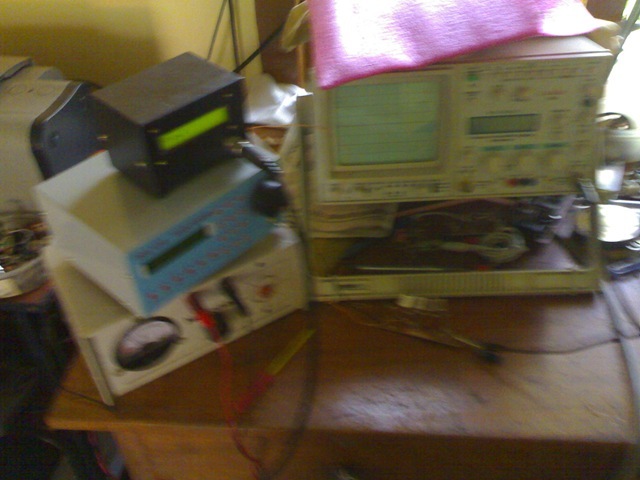 I have the following test set up in my shack. I terminated both sides of the filter with 200 ohm resistors and then the DDS out put was fed to the filter. The DDS frequency was varied and the filter output observed on the CRO. I have taken readings at 100 Hz apart. I plan to plot a curve using gnuplot tomorrow. A low cost PIC 16F877 prototyping board is being developed at College of engineering Attingal under my guidance. The credit for develoment goes to Shibu and Manoj. The board is intended for classroom use. 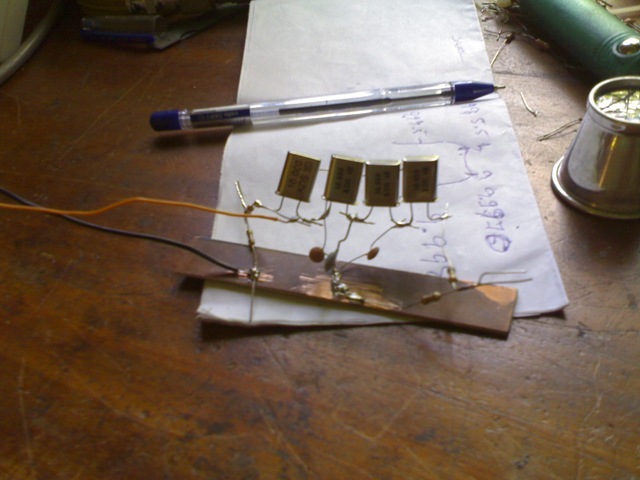 The idea is to provide a low cost platform for experimenting with PIC micro controllers. The proposed board will have easily attachable daughter boards for connecting various accessories such as key board, LEDs , switches etc. 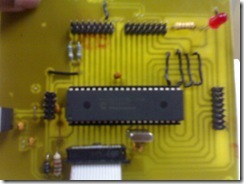 The board will be programmable via serial port through an ICSP programmer. The first draft schematic of the board is give below. 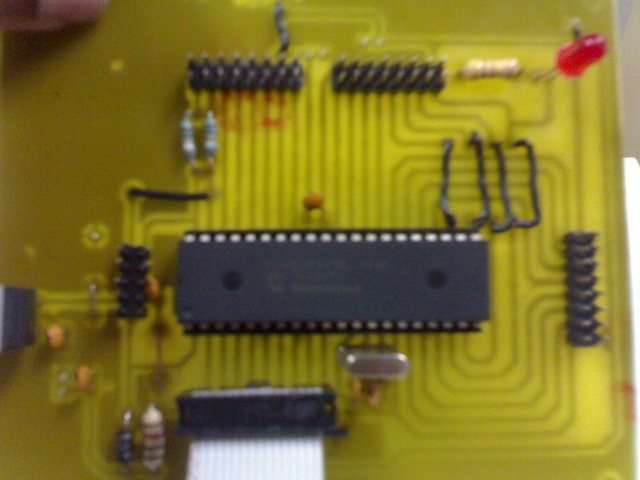 This board contains a PIC 16F877 and ICSP programmer interface. All ports of the PIC are available via FRC connectors. 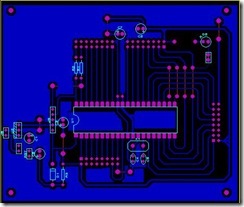 The PCB pattern along with component lay out for building the board is shown below. 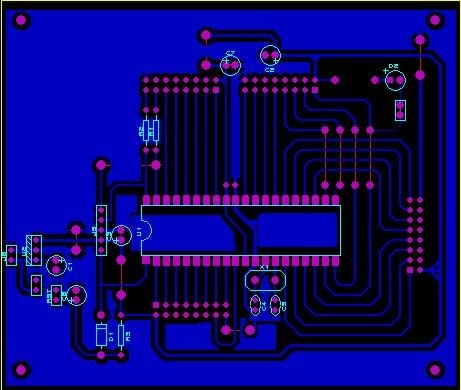 You can download a PCB pattern suitable for homebrewing can be found here. We have just completed the first board and pictures of the same are provided below.